The idle moments bit that’s taking place on the ground cloth area NOT used up by my two forehead cloths has taken on a life of its own. 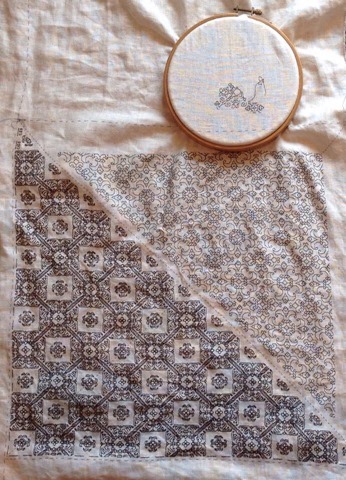 Frankly, it started out as a delaying tactic – stitching was too much fun to stop and tend to finishing the two now-completed kerchiefs. But it has become more than that. 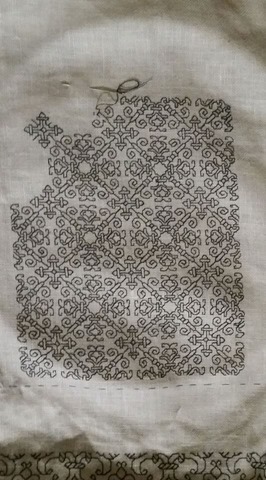 I started out with another large-fill design, of the scale that rarely gets used in inhabited blackwork work. 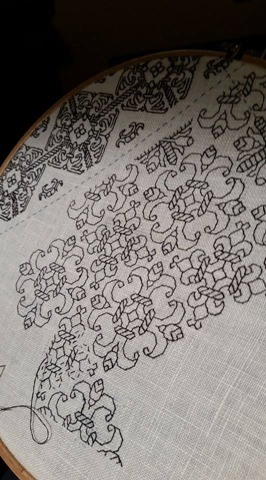 The motifs are just too big to fit into any but the absolute largest areas in a standard dark outline, fancy fill project. But they are on the scale of the regular fills shown in rectangular areas at the bottom of the famous Jane Bostocke sampler. So why not? This top fill (for the time being) is quasi-original. 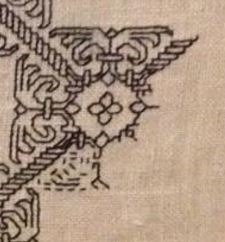 I drafted it up, based on this linear design, appearing on another oft-cited sampler, the V&A’s T.14-1931. I’ve used that design as a teaching piece for years. It’s in TNCM, and a tutorial on double running stitch logic featuring this design, complete with a chart for it is here. For this piece I used the center motif, rotating it fourfold, and elongating the “stems” into a grid with a secondary motif. I stitched it using two plies of the four-ply hand-dyed silk floss I am using. The next bit was the motto, described in the last post, so I won’t reiterate here. Just below the motto is another motif that will be featured in the sequels to TNCM – a scrolling grapevine, with very angular, striated branches sprouting off more organic and woody trunks. I wrote about it here before. The space for it was too small to show the entire repeat, so I focused on the center bit, which left the gnarled fat branches off. Again, this is stitched using two strands of the silk. Below the grapes is a curious design, also from the TNCM sequels. Although it’s shown in the book without a fill, I chose to execute it with one here. The design is entirely mine (one of the few totally unsourced pieces in the collection). On this one I experimented with thread thickness. 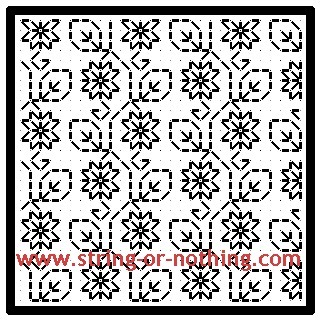 All of the stitching is double-running, but the heavy outlines are worked with the full four-strand thickness of the floss. The flowers are done in two strands, and the radial symmetry stepped fill is done in one strand. After this comes another narrow strip pattern across the top (I can’t abide wasted space); plus a narrow border to frame the entire area. The border and possibly the narrow top strip will be done with thread from a second batch of black silk, also hand-dyed with a historically appropriate dye by my Stealth Apprentice. The goal is for me to “beta test” her output, and report back on the stitching qualities of each of the slightly different recipes. As for the sequel(s) to TNCM – yes. I am working on them. Yes, it’s going slowly. It’s intensive, and having finished the whole book, having to rip it apart and remake it as two or three smaller volumes is proving more problematic than I thought. Some pattern pages need to be re-composed, patterns with cross-references in their historical profiles have to be sorted and kept together to avoid jumping between volumes; the intro material needs to be re-written so that it appears in balanced (and relevant) quantities across the volumes. Indices and referenced bibliographies entries have to be properly assigned to appear in the same volume as the patterns to which they are linked. This is taking time, and frankly, after a whole day of heavy editing for my professional job, sitting down and doing the same thing at night is slow going. Why am I re-editing and cutting the thing apart? Affordability. Right now at a heavily illustrated 184 pages, including historical essays, how-to material, 75 plates with over 200 individual designs, research discussions, the bibliographies and indexes, for electronic publication, the break even point would put the per-copy cost in the neighborhood of $175, and even more for on-demand paper copy printing. That’s flat out too much. I am hoping to offer smaller books at a more accessible price point. So apologies. They are coming. Slowly. Waaayyy behind on my blogging, I’m now not only finished with the stitching on the first Forehead Cloth, I’m finished with the second one, too. Because I have only a limited supply of the excellent hand-dyed thread, and the first triangle had a voracious appetite, I decided to work the second both smaller in size, and with only two plies of the four-ply silk floss. I am not sure that the thread maker intended it to be used stripped into plies, but with patience and gentle encouragement, I was able to do so with minimal tangling and no losses. Gentle finger spinning counter to the direction that the plies were assembled helped, as did tension on the strand while separating. And it worked! I have more than enough to finish, as you will see below. I liked the larger motif, but not the smaller one. It has a very prominent cross, and while it might not have been so apparent when a large area was worked, I noticed it. I am not comfortable wearing crosses, so I drafted up a new companion motif to use in its place. You can see the old one just peeking out at the top of the photo below, for comparison. I liked the visual balance of this one better. While I lost some of the light/dark checkerboard effect of the original, I gained an interesting play of curves and frames. Considering that this pattern conforms to the 45-deg/90-deg/180-deg composition rule found in just about every historical piece of linear stitch count-work (“Knight’s Move” two-over-one up stitches are exceedingly rare), seeing curves at all is almost an optical illusion. After I finish the bonus bit on top, I will remove the basted guidelines, gently clean my stitching, and draft out the lining and strings. 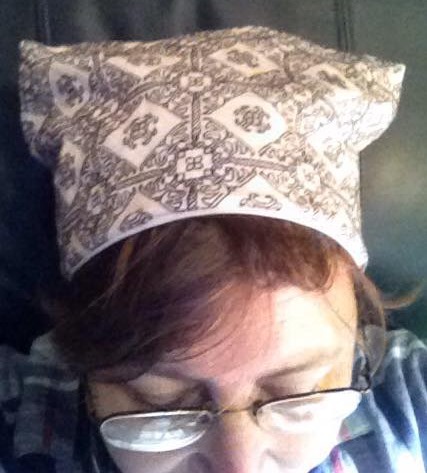 I’ve got some pre-shrunk muslin I’ll use as the lining. I may use a length of this even weave, folded or rolled into a quarter-inch strip for the ties. That appears to be the treatment most like the extant historical pieces. 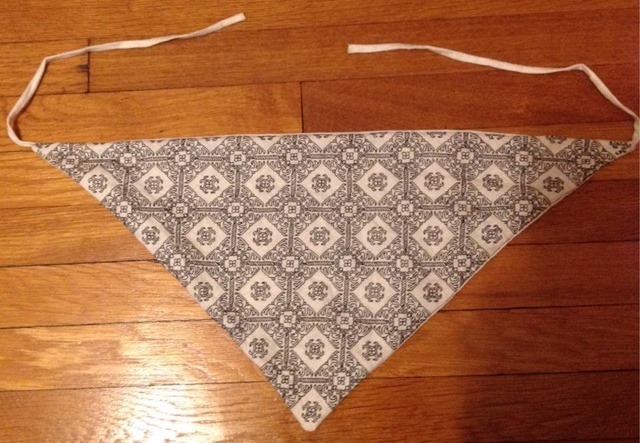 The other option is using some purchased woven tape, which I think would look clunky and mismatched, by comparison. In any case, there is no needle lace trim, adornments on the tie strands, or other embellishments for these. I suppose I could add paillettes to this one, but I’ll save that bit of effort for a future matched coif-cloth set. You said you proof against established work. What do you mean by that? 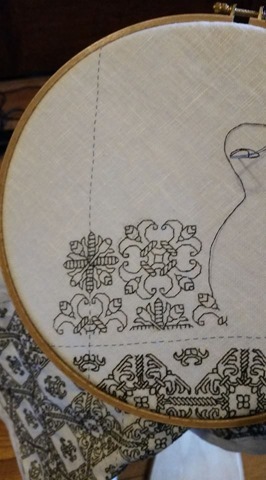 Another way to proof off established work is to work attachment point stitches when they are encountered, if I intend on finishing up that divergent design segment and making that meeting later on from another direction. It’s much easier to see and meet up with a little “twig,” and to spot potential deviations early on, than it is to meet up with a solid line of stitching, where identifying the individual stitches can be tricky, later on. What thread are you using/Where did you get it? I got it at Birka – four ply filament silk hand dyed using iron and tannin (full disclaimer here) by my Stealth Apprentice. She is launching a small venture producing historically inspired Roman jewelry, plus embroidery threads and ribbons dyed with historically accurate materials and methods. I am helping by being an early customer, sponsor, and “beta tester” for the threads. Now on to the doodle. That little lump in the hand-held frame above the two triangle-shaped forehead cloths… What the heck is that? I’m not sure what will be below the motto, but whatever it is will keep me doodling for another week or two. For those who want more info, the alphabet I used is here. I have just two corners left. Although I have been using my sit-upon tambour (round) frame for this project, I will now switch to a hand-held hoop. That’s because it’s significantly smaller, and better able to get close to the edge of the cloth. On thread consumption – I started out with a 100-yard skein of the hand-dyed filament silk. What you see here is the entire thing. Every inch. Luckily, I have another and will use a bit of it to complete. Here are some more answers to questions posted here and other places where I’ve shown this piece. That’s because I’m primarily working this in double running stitch, which the assiduous can make entirely double sided. 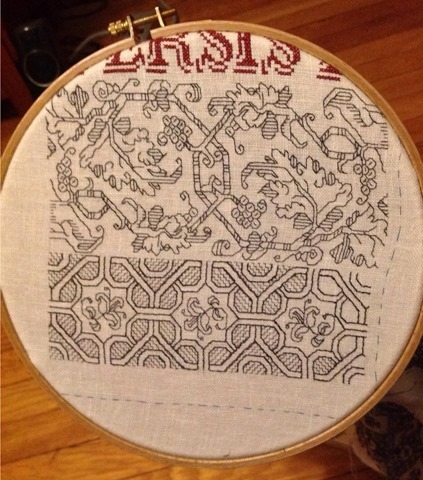 I am not bothering (note the presence of Evil Knots) because this cloth will be lined. How do you keep your knots from pulling through? On the terminal knots, I run the thread under an established stitch and do what amounts to a double hitch knot, then use my needle to pierce the newly made knot, pulling the thread tight. This acts as a second lock and prevents unraveling or pop-through. How do you determine your double-running baseline in a complex design like this? I know I’ve written extensively about finding the baseline, but in this case, there isn’t just one stitching logic. There are many, and they are all situational. Do I want to go “out and back again” so that the active end of my line of stitching ends up near the point of origin? Do I want to just head out in one direction until I run out of thread, then follow up with a second strand, filling in my every-other-stitch? Do I want to establish the location of a design element, then go back and fill in detail later; or do I want to do every detour and departure on the first pass, leaving only a minimal amount of work for the second pass? How much thread is left in my working strand? Lots? Just a little? All of these thoughts combine and influence my path planning. I can say that the stitching logic in no two of these repeats was identical – it was all done to optimize the remaining thread, cover the design without omissions, and to make counting and alignment as easy as possible; and the mix of those factors at any one time varied wildly. However there is one thing that ended up being of great help in keeping everything properly lined up and accurately on-count. 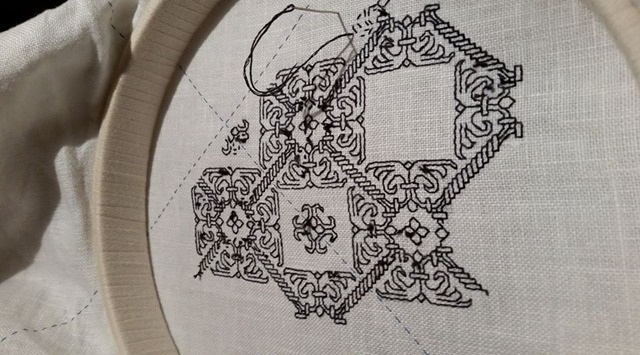 When I have a T-intersection, on the first pass I include the “attachment stitch,” so that when I come back and link up to that segment, the exact spot is easy to find. Otherwise, if I continued straight along the top of the T, when I came back later and had to add the vertical, it would be harder to know if my alignment was correct; if the new addition had synched up correctly to the prior work. You can see this in several places on the snippet above. Look at the heavy stacked diagonal at 1:00. On its base, where it joins the circular plume-flower medallion, I’ve left a little vertical hanging off the foundation 1×3 rectangle. That’s an attachment point. As I near it on my next stitching pass, I can cue off it to proof my work as I go, and know that I am on target for an absolutely aligned attachment point. That’s also why I have those little barbs sticking out on the base of the as-yet-to-be-stitched diagonal at 5:00. What are you going to do with the rest of the cloth? 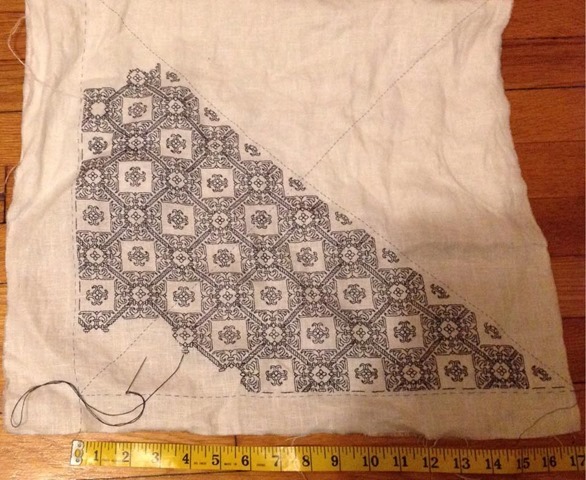 It would be a shame to cut out my completed triangle, leaving a difficult to handle remnant. So I am going to stitch a second, smaller triangle opposite this one, leaving cutting room between them. After I’ve finished #2, I’ll assemble both forehead cloths. Not sure what motif to use on the second one, but likely it will be less dense, because I have less thread. What are you using for the ground? Do you like it? I’ve had this piece of MCG Textiles even weave in my stash for at least a year, maybe two. It was the last bit of 32-count linen ground on the shelf at a local JoAnn’s big-box crafts store. I do not recommend it. I have to say that I’m spoiled by higher quality linens at this point. I am finding too many irregularities – thick/thin threads, slubs, surface matting, and the like, that are affecting the look of the finished project. There’s one area in particular that drove me crazy – a segment of a few inches in which every other thread was super narrow. Countwork there was not fun at all. In addition, it’s not really an even weave. There’s a distortion if you compare north-south to east-west. (I can’t tell which is warp and which is woof because the bagged segment had no selvedge on it). I grabbed it off the top of the stash when I started this because it was a nice coarse count, the size of the piece was suitable (minimal waste), and I wanted to begin quickly, without ordering or hunting for materials. That small bit of solid blue cross stitch at the bottom? I hate it and will be picking it out, presently. 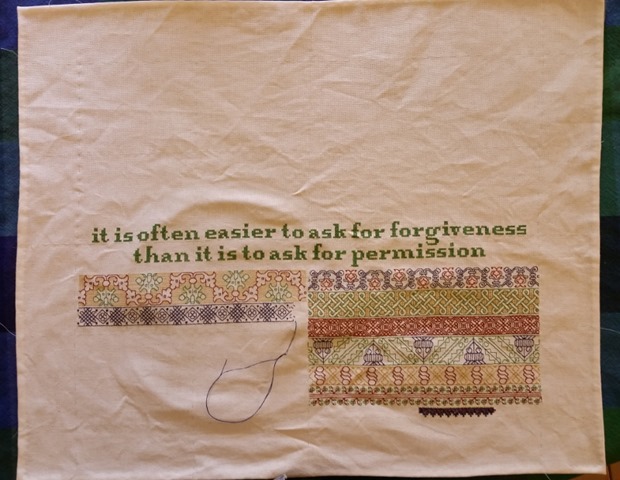 Originally I wanted to frame the piece top and bottom with a denser border, done in cross stitch. But I don’t like the look. 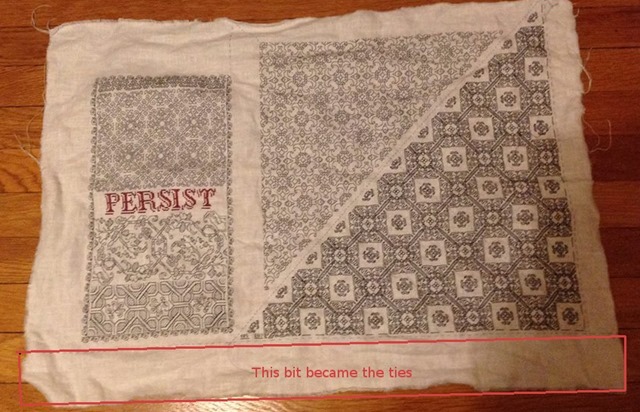 The bottom border will still be blue, and will still span the entire width of the piece, but will be something directional in double-running, instead. Both are patterns from my forthcoming The Second Carolingian Modelbook. 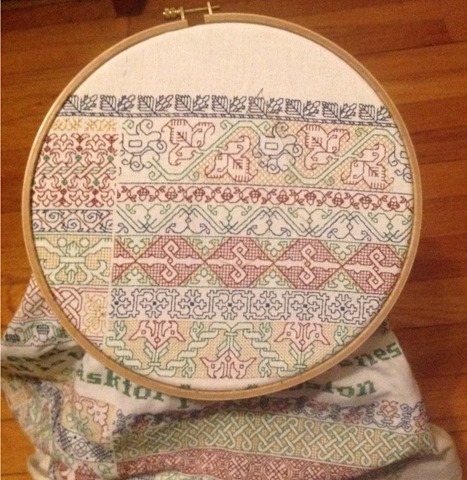 The top one is done in two weights of thread – double strand for the red and green sections of the motif, and single strand for the yellow half-cross stitch ground. There’s no historical precedent that I can find for treating the background of a voided piece this way, but I do like the look of the more delicate field against the heavier outlines. It’s something I’ve used a couple of times now. Since there’s no requirement for this piece to be historically accurate, why not play? The pattern itself does have a source – a stitched sample book of designs in the collection of the Metropolitan Museum of Art, with a posted provenance of Spain or Italy, early 1600s. As for the lower bit, in blue – that one is interesting, too. This is an excerpt from “Tafel 47” in Egenolff’s Modelbook of 1527. Note that the original is clearly a freehand piece – not graphed. But it translates very neatly to work as a counted pattern. If you look closely at some of the freehand drawings in Egenolff and his contemporaries, you’ll see that (to my eye at least) they were intended to be congruent with counted execution. That’s not to say they couldn’t be done off the count, but with constrained angles, no fine detail, and geometric execution, working them that way is a cinch. Back to my modern piece. It’s pretty clear that the area below the words will be two columns of strip patterns. I am still thinking of what to do in the top part. I could do more strips of similar proportion. I could do one moderately wide strip (the area there is too narrow north-south for any of the really big patterns in T2CM, believe it or not). Or I might do a collection of spot motifs, or one large all-over. I haven’t decided. More bungee jump stitching ahead, as I continue to design on the fly. It’s done. All 80+ gears, each with a different filling pattern, worked with well-aged “Art Silk” (probably rayon) purchased for a single rupee per skein in India, on 30-count linen. 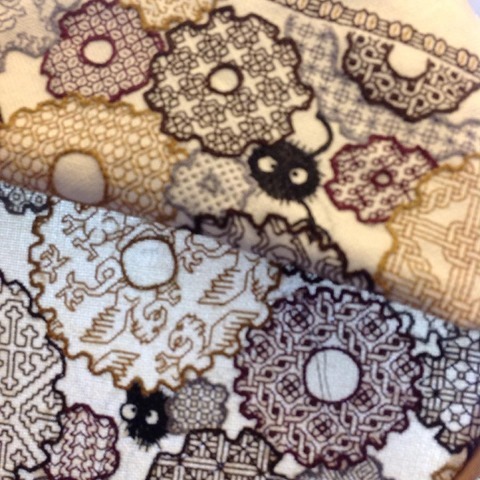 The soot sprites (little black fuzzy creatures) playing the part of “Trifles” are in discontinued DMC linen floss, so that they contrast shaggy and matte against the brighter, smoother silky stuff. I’ve also attached some real, brass gears as embellishments, to add extra Steampunk flavor. 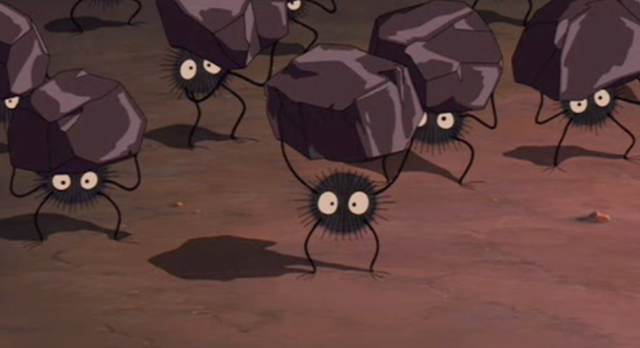 Here’s a close-up of the sprites in process, adapted from the little soot creatures in the movie Spirited Away. To stitch them I worked totally off count. (Yes, I can do that, too). I outlined the eyes in split stitch using one strand of floss, and placed the eyes’ pupils, using French knots. Then I worked long and short stitch, encroaching on the split stitch eye frames, to get that spiky, unkempt, hairy texture. 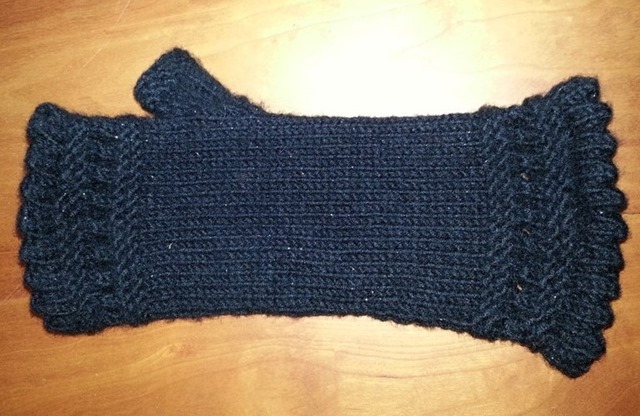 The arms and legs are close-worked chain with two strands, with the little toes and fingers (what of them there are) also in split stitch, but with two strands. 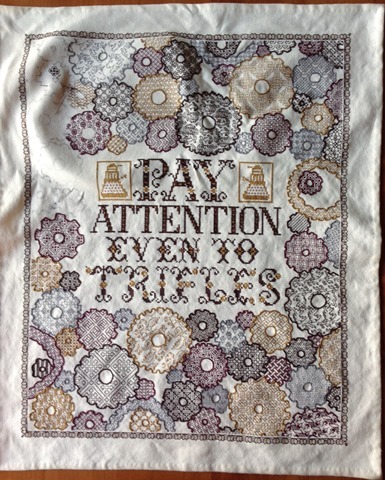 The gears are filled in using (mostly) double running, with some departures into “wandering running” using two strands of the very fine art silk floss; and outlined in chain stitch using three strands of the stuff. All threads used were waxed using real beeswax, for manageability. The saying itself is particularly suitable for the target Daughter. It’s one of Mushashi’s Nine Precepts. The Daleks are from a graph by Amy Schilling, intended for knitting. The narrow border is in my forthcoming book, The Second Carolingian Modelbook. I found all of the alphabets used (there are four) in Ramzi’s Sajou collection. The gear shapes are adapted from a freehand tracing of a commercial airbrush stencil by Artool. Most of the gear fills can be found in Ensamplario Atlantio. The few that aren’t from that source are recent doodles, and will be made available in time, either as a fifth segment of that work, or perhaps as their own stand-alone sequel. Ensamplario Secundo, anyone? Now Younger Daughter doesn’t head off to school until next fall, so I have about a year to add hanging tabs, or back the piece with contrasting fabric to make a scroll-like presentation. 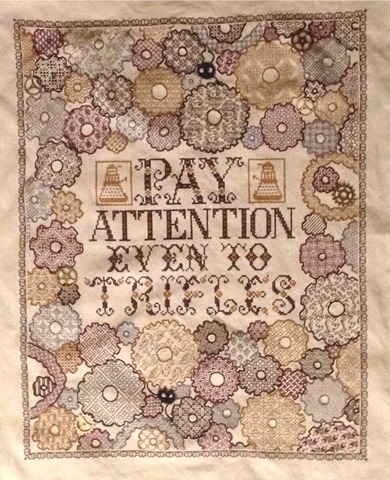 So while the stitching is complete, this piece may revisit String when I decide what the display treatment will be. On to the next. I’ve got two more original stitched pieces in queue, with only a general idea of what each one will be, and what styles/designs/colors I’ll use. Free-fall stitching! Gotta love the adventure! After lots of happy chugging along, as you can see Trifles is nearing completion. I’ve got only eight more gears to finish up, including the two in process now. Then come a couple of “Trifles,” modeled on the little soot demons from Spirited Away, another special request from the target recipient. The hapless little things will be prisoners in the mechanism. Finally, if there’s room and it looks good, I plan to add some brass watch gears for extra Steampunk flavor. To answer questions, no – I am not planning this in advance. I choose the fill and color as each new gear presents itself. I chose to use four colors as a nod to the (rarely used) four color theorem, which states that any contiguous plane map can be colored in using only four colors, and have no two regions of the same color touching each other. In my case as a non-mathematician, this was done on a lark, and adds geeky joy. I do admit that a little logical thinking has been used to select the optimal color for each gear, in a “If I make this one brown, then this one will have to be gold, and that one must be maroon,” sort of way. 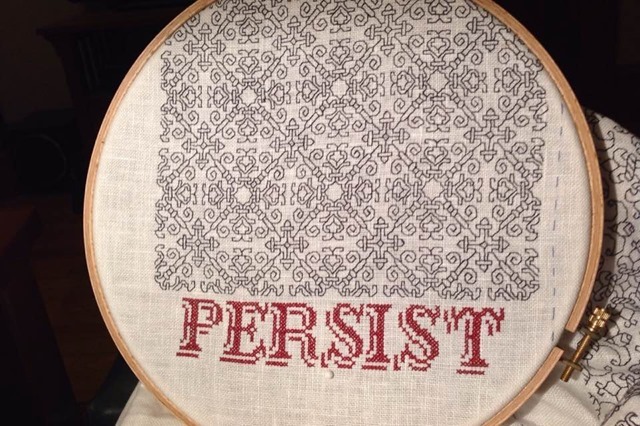 But again I haven’t sat down and plotted my plan of attack, other than to make the juncture point where I finish adding gears around the motto be the narrowest point of the sampler, to simplify any color meet-up issues. 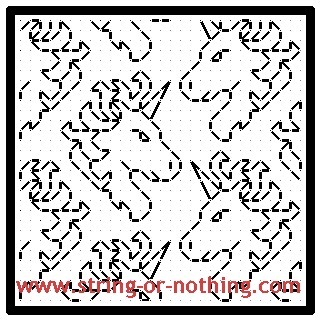 The rather annoyed unicorn is an adaptation of a motif from the open source pattern group exercise I hosted here back in 2010/2011. I have to say that doodling these is addictive. Just playing around, I’ve put together twenty more design squares, including those I collected from the Victoria and Albert Museum smock, item T.113-188-1997. I could easily do dozens more. Now comes a question, with T2CM now finished and awaiting only resolution of logistical and publication issues prior to general availability, do I release the new group as a fifth section of Ensamplario Atlantio, or do I go on and start on Ensamplario Secundo?